to have these things always in remembrance. " Well, she didn't know how shortly she would be putting off her tabernacle, but August 2, 2011 marked the ten year anniversary of Dave's mom's death. She died in 2001, just before the Trade Center went down. 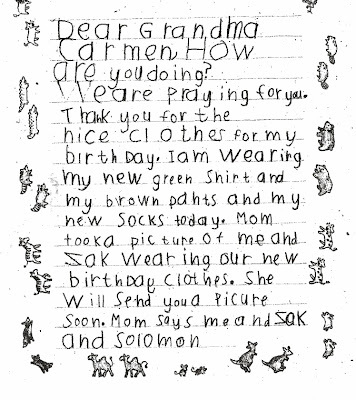 The anniversary has come and went, but we all definitely wanted to share about one of the wonderful blessings of Grandma Carmen's life to us, and how it continues to bless us. About 4 years before Mom's homegoing, we moved away from California and began our sojourn in the midwest, beginning in Minnesota. Grandma and "the top five" shortly before we left California. 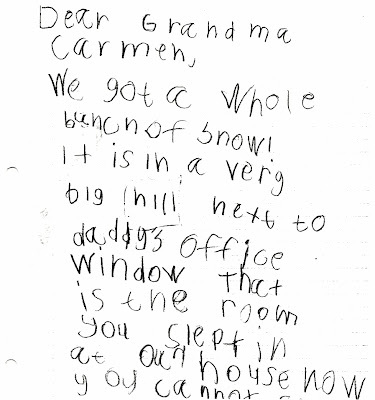 Now, from almost the beginning of our homeschool, we have used letter writing as one of the primary tools for teaching our children writing, spelling, grammar, punctuation, and the whole enchilada. It really fit in with our realization that God intends real life to be a vehicle for teaching our children-- not an interruption. It also seemed like a really good way to teach our children to put the "golden rule" into practice! All of our children have had fairly good motivation for writing simply because they knew that their writing had a purpose and destination. Great-grandparents, cousins, aunts and uncles, great-aunts and great-uncles and former neighbors were put on a correspondence list, along with addresses. Enforcing good penmanship and spelling, etc. was simplified for Mommy as the children understood that a person outside our family, unfamiliar with the things which they were writing about, would have to decipher whatever they sent. And when the destination is a grandparent, the children are especially motivated! Our procedure, which varies in complexity as the child gains skills, includes making a paragraph list, writing or helping dictate a draft, proofreading (including teaching spelling and mechanics of writing) with Mommy or an older sibling, writing a final copy. Often, the child would include a picture they had made. 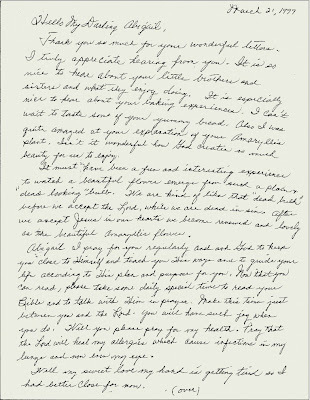 Sometimes they would include illustrations in the text of the letter (which REALLY motivated them to plug away). 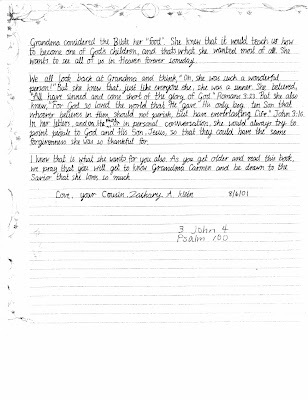 On some occasions, older children would do a final copy on the computer, but the norm is handwritten. Thankfully, we have rarely been without a photocopier in our house, so the originals of the children's letters have been saved through the years. 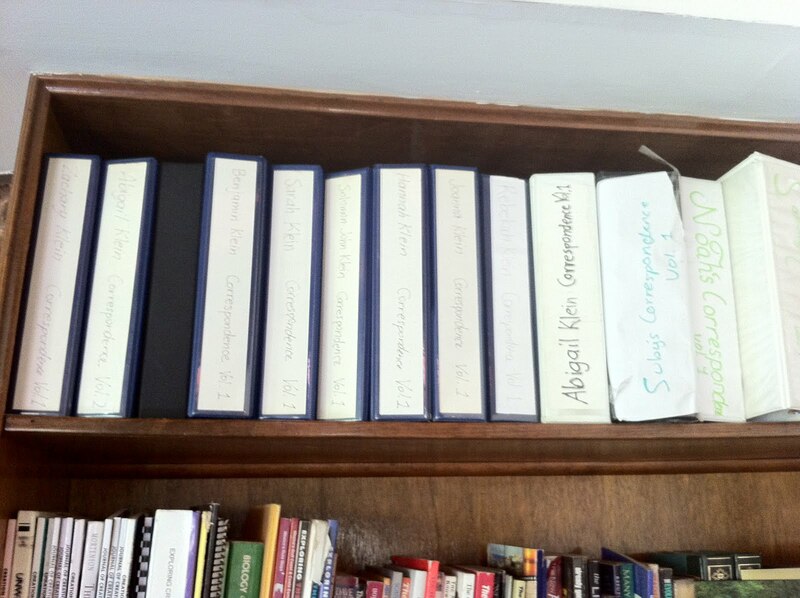 We file them in binders, one for each child. Since they usually record the current baby's doings, the letters provide fodder for the x number of baby books we have yet to put together (I have peace in knowing the data is all available!). a family history of the things the Lord has done for us. There are numerous blessings in this way of teaching our children writing. God has used their letters to touch many people. Many people are just so unaccustomed to receiving a letter! 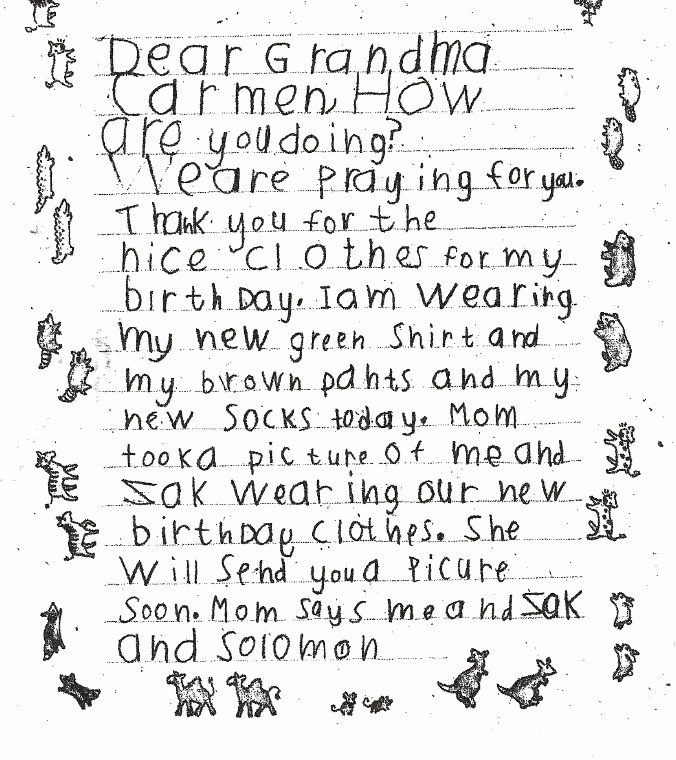 But some of the most precious blessings are the return letters. We told our children from the beginning, we don't send letters because we expect letters in return. We desire that they learn to just try to bless others with their letters. But of course, there is a lot of joy when letters are received in return. 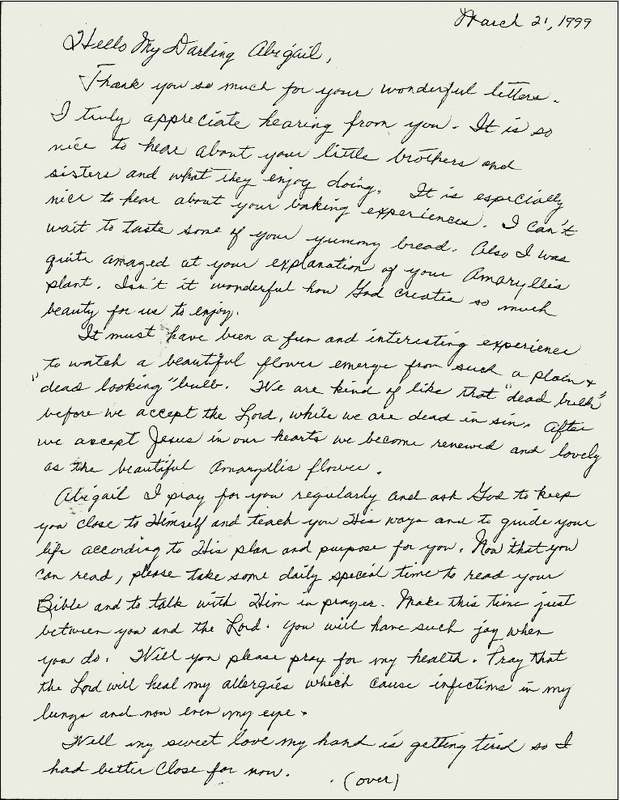 In the letters she left behind, Grandma shared her prayer requests, her love of the Bible, exhortation to obey parents, fun memories of growing up in a household with 13 children, memories of their daddy's childhood, favorite meals and pastimes, and testimonies of her dependence on the Lord. She wrote about that which was most important to her and what she felt would benefit the children the most. Our last family trip to California before Grandma's homegoing. 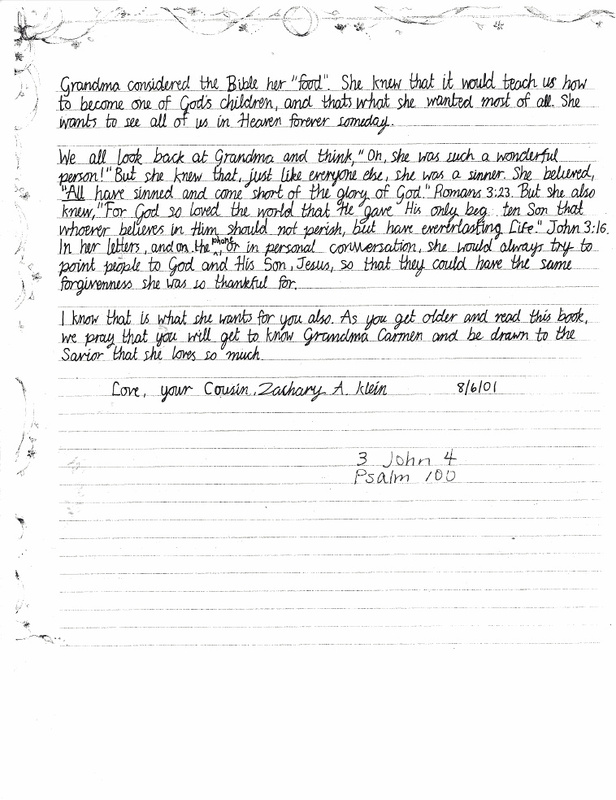 Our correspondence continued, and the younger grandchildren became additional correspondents as their abilities improved. Grandparents are always the preferred recipients! This kept all the grandparents quite busy, though it was probably the most labor intensive for Grandma Carmen. 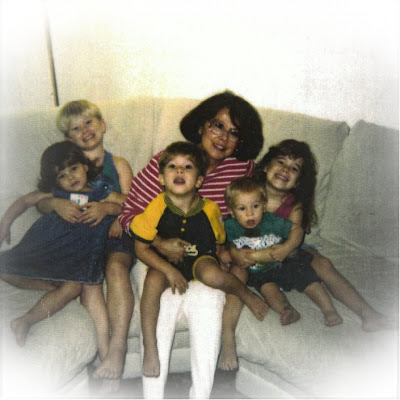 On August 2, 2001, a few days after surgery for cancer, Mom unexpectedly went to be with the Lord after experiencing complications. It was also days after Dave's sister gave birth to her first child, Lara. 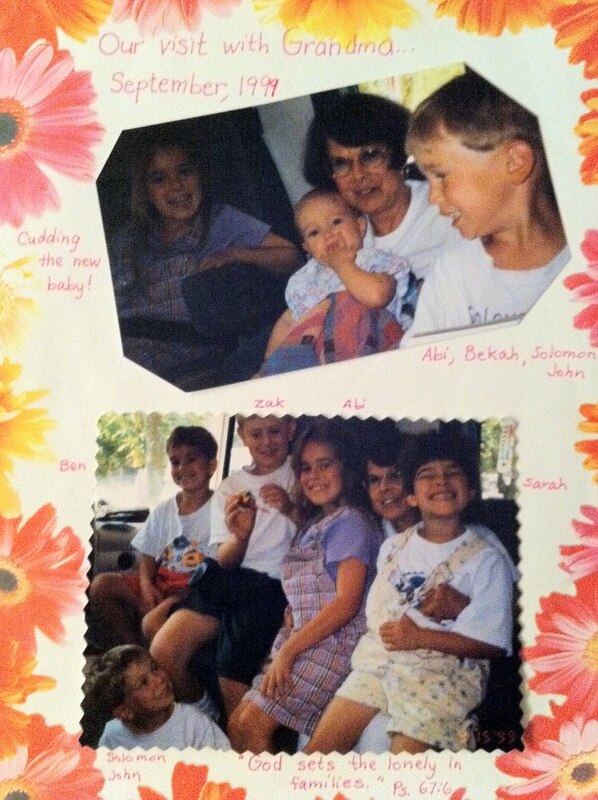 Mom's funeral was a week later, allowing her children who were out of the area to have time to travel back to California. It was a 2 day drive for us, packed in our 15 passenger van, with our family of then 12. We were kind of dazed at times as we prepared for the trip. 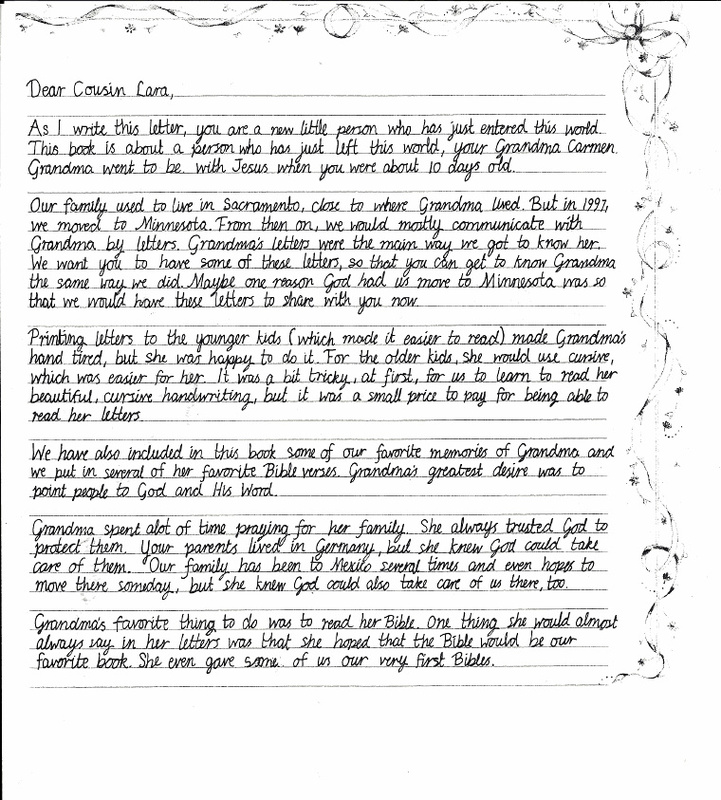 But an idea coalesced as we collected a bunch of Grandma's letters to bring with us. And before we left for California, a dear friend brought over a beautiful memory book with plastic sleeves for keepsakes...such as letters. As we made the trip back to Sacramento, from their seats in the van, the older children wrote drafts of what would be added to the memory book... for baby Lara. We rushed and prayed them through copying the final copies on the fancy paper. I cried at Kinko's as I copied all the letters, placing the original letters in the sleeves of the memory book. I cried because it was just so cool to be able to do this. to have these things always in remembrance." After Zak read his text, he presented the book to Lara's mommy. It was (and is) so wonderful is to have so many precious letters for Lara. It was also a confirmation of the way the Lord had led our family, because it was our move from California that caused us to add Grandma to the correspondence list. 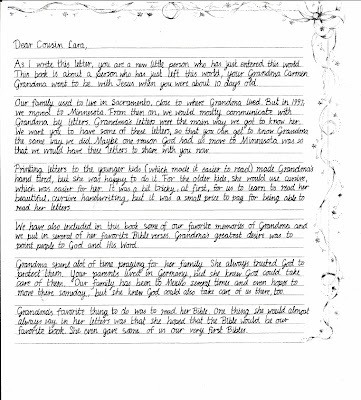 And it was the number of grandchildren that caused her to have to write SO MANY LETTERS. So, teaching writing and language arts through letter writing has produced much fruit...much more so than any other kind of writing we could have pursued. 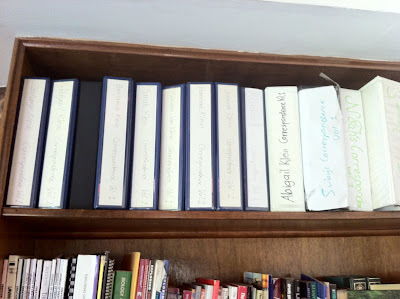 Dave and I look back on all the writing we were required to do in school and college...no, actually we don't look back on it; about every bit has been thrown away! We wrote almost nothing of importance. But we consider what our children have opportunity to write of much more importance, and that affects the way we teach writing. 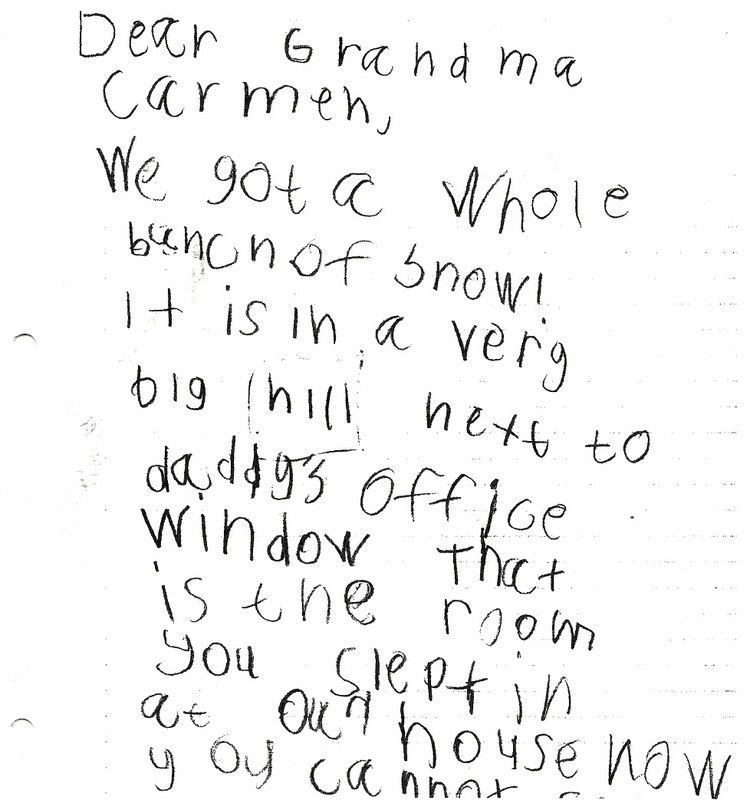 Grandma's letters were certainly a lasting example of such writing. To encourage other homeschooling families, we have shared more specifics of what we have done, and just our excitement in seeking and receiving wisdom from the Lord regarding the teaching our children, in this session on our website. I laughed at the beginning of this post, and cried at the end ~ Perfect! It is with tears that I thank you for letting God use you (all) to be vessels for HIM to help others in many ways. Ways that you may never know & yet so clear to others that it is from the Lord to continue in a way that HE has lead & when we get discouraged HE finds & sends us right back on the path we are to walk! God's light shines through in all you do! It's with tears I say "Praise the Lord!"